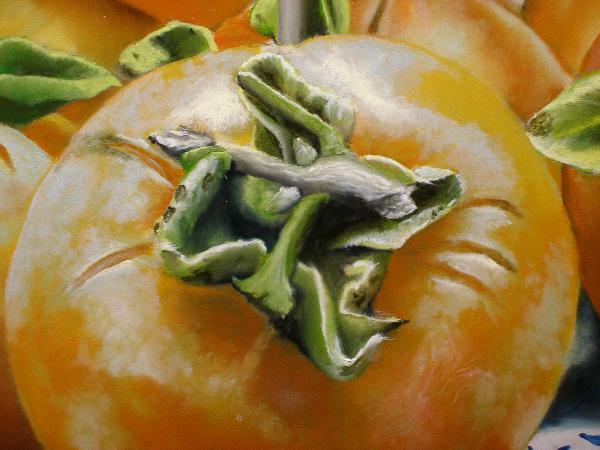 Still life fruit, how to paint persimmons, those sour to sweet wonders. 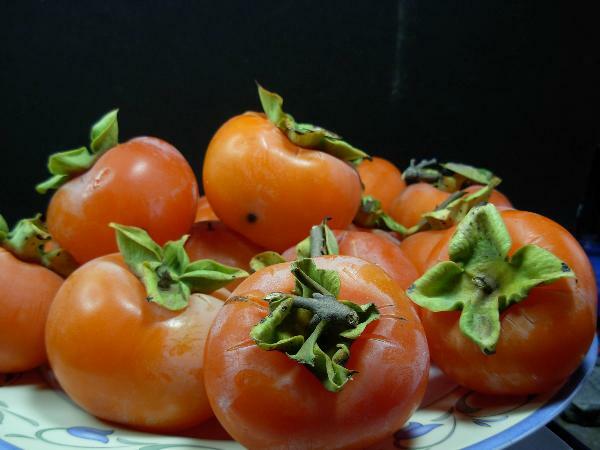 With persimmons and a dish as the subjects. Still life fruit. 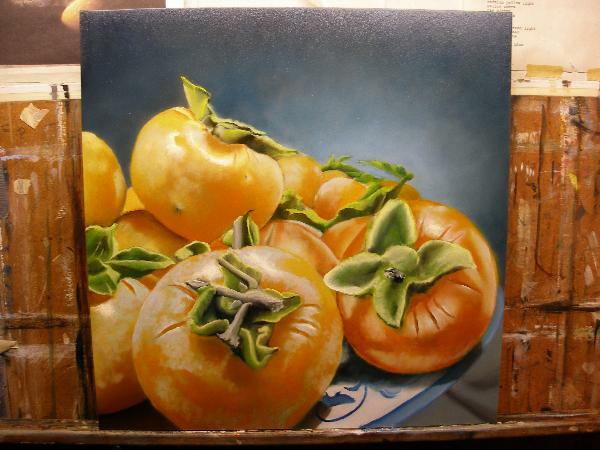 We continue in this section, how to paint the final color layers and finishing layers of these persimmons. 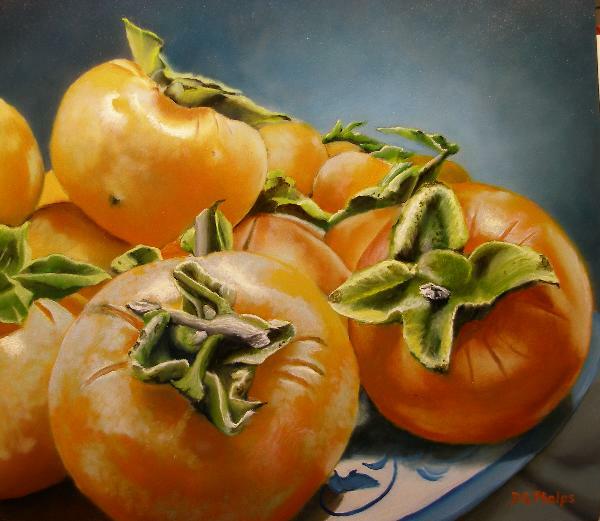 Hopefully, the oil painting techniques discussed will excite your enthusiasm as much as these persimmons excited my taste buds after the painting sessions ended! An update is in order, it's at the bottom of the page, so don't miss it! Last time, we left you here, with the dead layer completed. One thing to notice here. 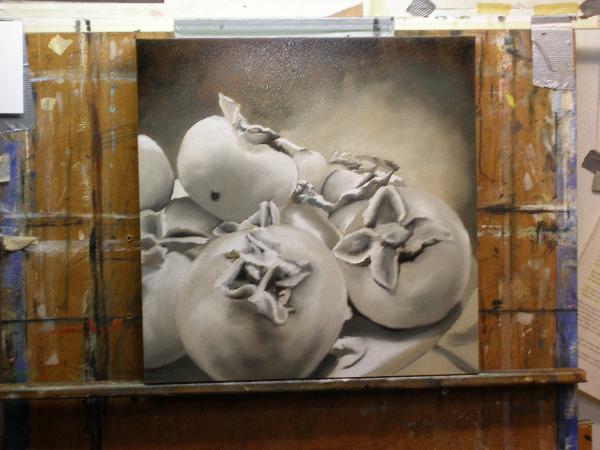 No texture, only your main elements, a few details, and mostly shadow's and modeling of our still life fruit. 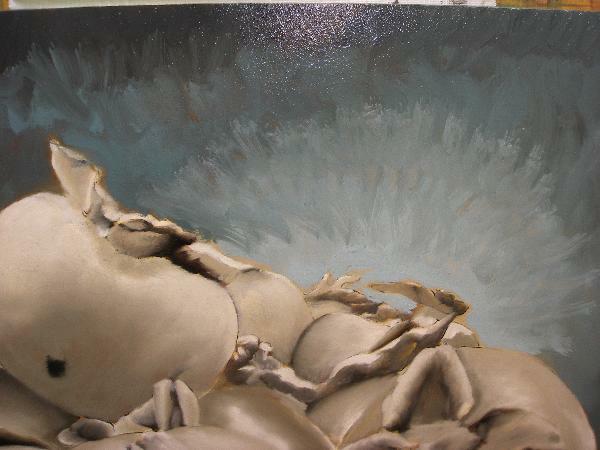 Lets start our color layer with some contrasting blue for the background. This I feel will make the foreground persimmons want to POP off the page. A nice, but subtle artist trick for future reference! 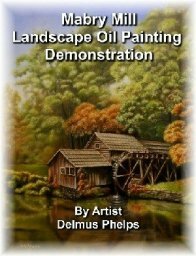 This site is full of little how to paint tricks and tips, so keep an eye out for them! 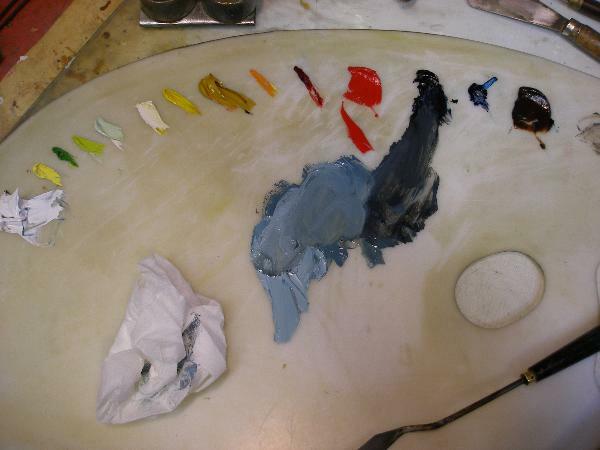 The blue's are laid in very loosely with a small brush to keep control of where the color transitions take place. Now, mixing the cad yellow light with a bit of cad medium red, we get our orange. I add also a bit of umber to darken it. Basically 2 colors! 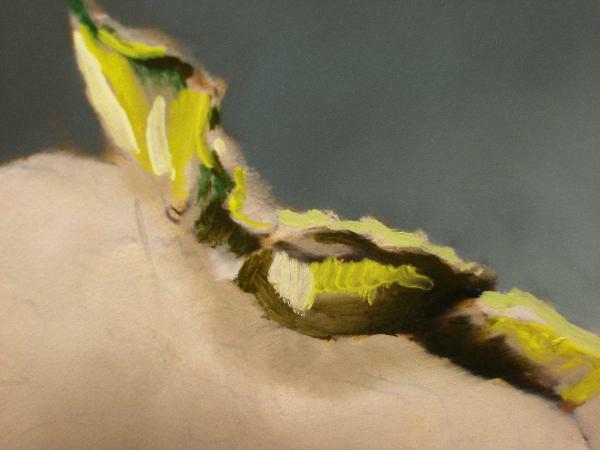 I also go ahead and lay in some green (cad light yellow & prussian blue) with more yellow than blue for a very light green, and start on a few leaves. 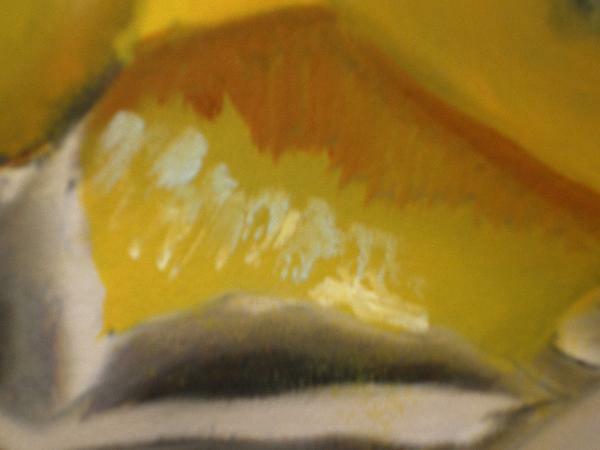 Using a small filbert brush, I begin blending and then follow up with the large mop brush. 1. Colors are laid in throughout the entire painting, blocked in. Check out the fruit on the far right. 2. I've come in and added just a few highlights to the fruit. This was a simple gray/blue mix that represents the frosty film that covers each fruit in just a few places. 3. 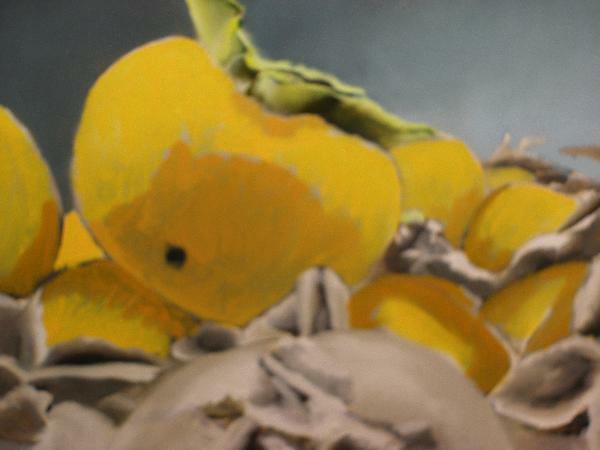 I've also added sunlight reflections on only three of our still life fruit. 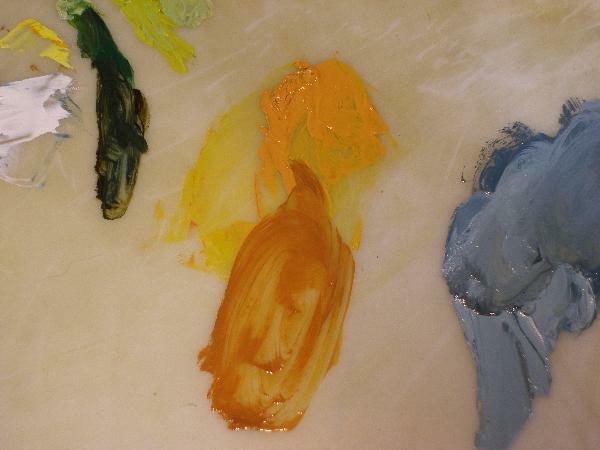 This was just a matter of a few strokes of white/yellow paint that was blended on its edges. A closer view of the focal point. The gray blue dusting, the 2 highlights were done, wet-in-wet to the orange underneath. The fruits details (like the spot) and modeling really is coming from the gray layer underneath making this appear to have so many nuances, when in fact, it is only the two oranges, some gray/blue, and highlights! 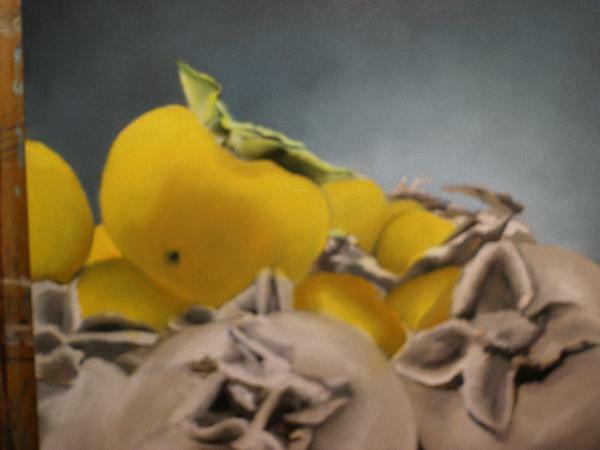 After an overnight of drying, the blue plate, details on the leaves, and the foreground still life fruit were more developed. 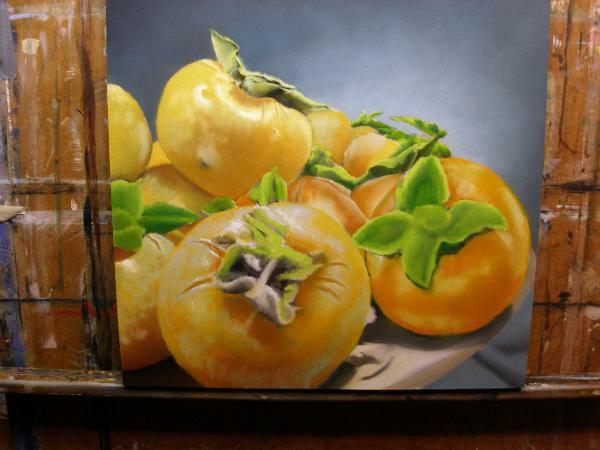 Here we see the completed still life fruit painting with again more details developed in the leaf structure of the foreground fruit. An red/orange glaze was added to each fruit on the left side to deeper the color there. Additional white was added to all highlights to bump these up again and a signature. 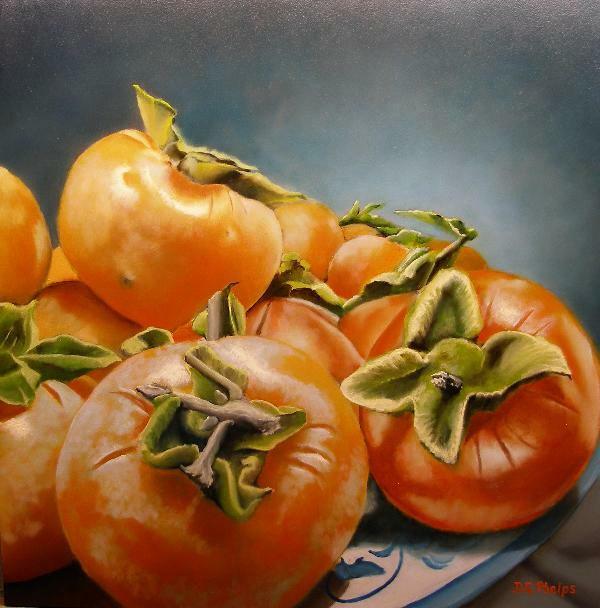 I hope I've shown you how to paint a persimmon at this point, and also introduced you to a this wonderful flemish technique. Our reference photo once again of our still life fruit for comparisons. As you can see, some cropping of the original image took place, and the main difference is the addition of a blue background rather than the black. Update! 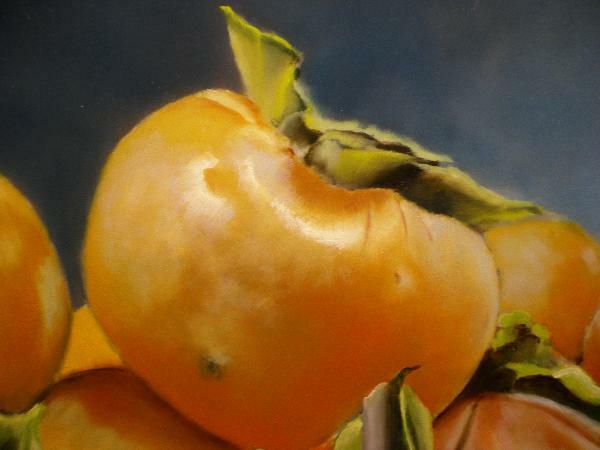 to how to paint a persimmon. I just received an email from a reader that asked the question, why is the stem gray? Well, it's not supposed to be! My reader is a very good observer and the email reminded me that I needed to correct this on the site. Their email also brought me joy! As it described a rekindling of the desire to paint again through information from the site! I can't tell you how much that means to me. Dr. Sun... (You know who you are) a Big THANK-YOU! In today's fast paced world of television, computers, video games, it's hard to find a hobby and past time that brings such enjoyment as painting. And if done right, it can be an almost everlasting enjoyment to viewers of the fruits of your labor. Learning how to paint is the first step. Leaving old criticisms of your work behind, and learning how to do it correctly will help you succeed in this endeavor. I had previously received comments about my gray stems, so I did a touch-up. After checking my reference photo, I discovered my goof was pretty bad, so I went in with more color. I also added some frost damage to the leaves to depict the reference more closely. Here is the final painting as it is shown in the Gallery, some close-ups of the changes are also included below. 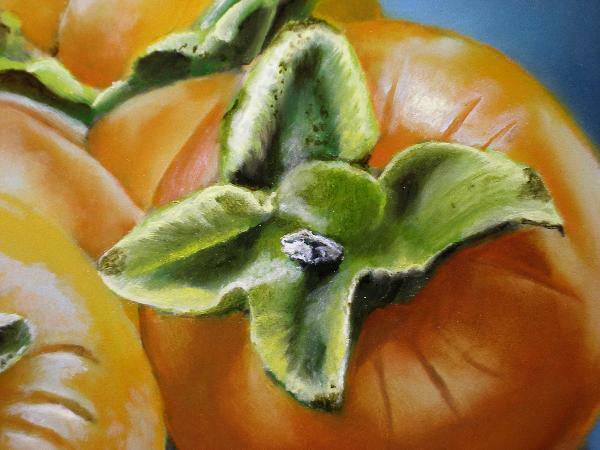 To the top of our how to paint still life fruit with persimmons page!